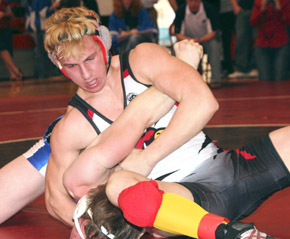 Although the Boone Central wrestling team did not have enough ammo to challenge for the team title, the Cardinals nonetheless turned in a strong performance in the annual Mid-State Conference tournament Saturday at Norfolk. With just nine wrestlers competing, Boone Central placed third in the eight-team field while seniors Tyler Iverson and Dustin Martin were crowned 2009 conference champions. In all, seven of the nine Cardinals competing medaled in the competition and earned praise from Coach Dale Bonge. “Everyone that wrestled for us contributed to the team score,” Bonge commented. “Unfortunately, with Kevin Krohn and Curtis Pribnow unable to wrestle due to illness and injury, we only had nine guys able to go. “With those two in the line-up, we may well have brought home the runner-up trophy,” Bonge said. “It also didn’t help that we only had four first-round matches. You can’t score bonus points – and, in some cases, advancement points – if you don’t have a first round match. Boone Central had four competitors reach the tournament finals. Iverson and Martin secured weight class titles and seniors Kaleb Carey and Issiah Bauld placed second. Freshman Jacob Meyer and junior Jerad McLean earned third-place medals and freshman Bobby Stopak placed fourth. Madison won the team title with 190.5 points. Battle Creek (118) finished just ahead of the Cardinals (110.5) for runner-up honors. Bonge was impressed with the efforts of his latest conference champs. “Tyler, from the #2 seed, had a bye to the semis where he scored a pin,” Bonge noted. “He followed that with a solid decision in the final against a very athletic opponent.